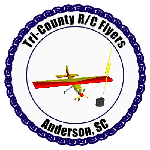 Tri-County R/C Flyers is a non-profit Radio-controlled model airplane club, formed to foster and promote the sport and hobby of flying R/C models, and is chartered by the Academy of Model Aeronautics (AMA - Charter 965). Tri-County R/C Flyers has been in existence since the early 1970's. Membership has dwindled because of the loss of the flying field we occupied since the mid 1980's but we now have a great new field located at the Anderson airport. Regular club meetings are held at the Anderson Airport terminal. Our airfield is located across the street from the main terminal(see map).The club meetings are held on the 1st Thursday of the month from 6:00pm-7:00pm in the airport terminal conference room. The club has a designated instructor who is available to teach beginners. This instruction is offered free of charge in the spirit of promoting the hobby to newcomers. Even club members who are not dedicated instructors are always willing to lend a hand and extend advice to beginners. New and prospective members are always invited to attend the monthly meetings, and everyone is always welcome to stop by the field and check out the action for themselves! If you are interested you are always welcome to join. The club does require all active members to hold a current membership with the AMA. For now the FAA registration has be reenacted. We do offer a social membership for those that do not fly. The social membership does not require an AMA membership. Our most common weekly flying times are Tuesday and Saturday from about 10 am to 12 pm. However, there is usually somebody flying in the morning on any good weather day.